Delivering a trailer is always good fun, as often the clients pick some very big shots to tease the audience and publicly declare how epic their film is going to look like. 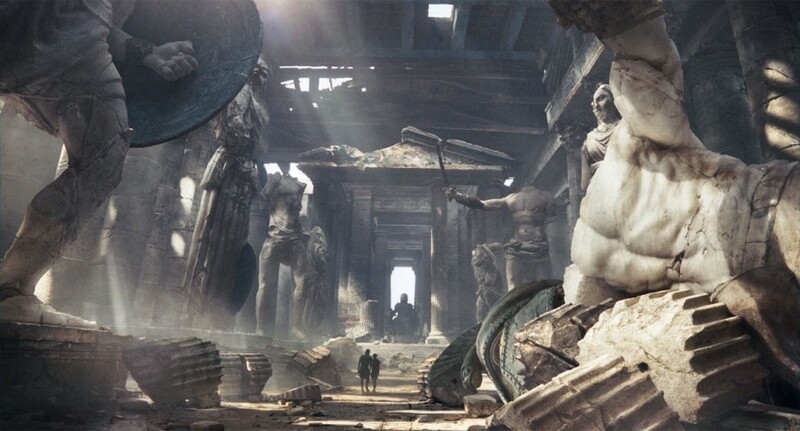 Wrath of the Titans couldn’t be an exception and this laborious shot with the main character and his son walking into a gigantic temple in ruin was planned to appear in the first trailer. So, the work was fast tracked and a “mini ninja team” of environment TDs and matte painters (with some help from Asset and Lighting artists) was assembled to bash the shot together in just a few weeks time. Sepp Sonntag, Scott McInnes, Thomas Mouraille, Florent Lebrun, Reina Sparks and Thomas Warrender where the lucky artists selected for the task. 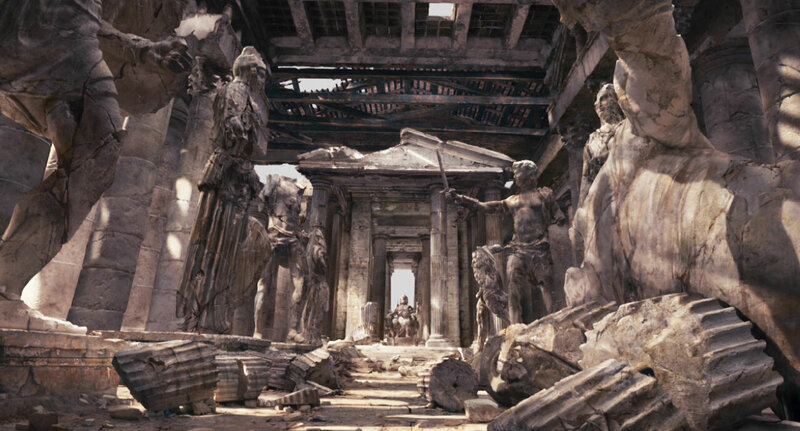 They managed to prepare the scene and cover the entire set through a matte painting with a strong textural character and I believe that they did a good job given the time they had. However, the trailer was postponed by a few weeks and the supervisors wanted to take this opportunity to rework the look of the shot. In order to have a fresher take on it, they called me to jump on the task. Given the history of the shot I had the luxury of basing my work on a solid CG setup and I could also benefit from some good elements that the previous artists had selected. I felt a bit like a lucky chef that can base his recipe on great ingredients and I truly hope I managed to prepare something tasty in the end. The last bit of the job was also a lot of fun as I worked closely with an excellent compositor (as well as a good friend) Gianfranco Sgura, to push and pull the elements through haze and volume lights, in order to convey a sense of scale. Normally it’s always best to engage in this kind of task during the compositing stage as this is were you can introduce animated dust and smoke elements into the equation. Gianfranco did also an excellent job at adding many small moving details to make the environment feel real. Mount of Idols Temple // DMP after compositing. Mount of Idols Temple // The final DMP before compositing. 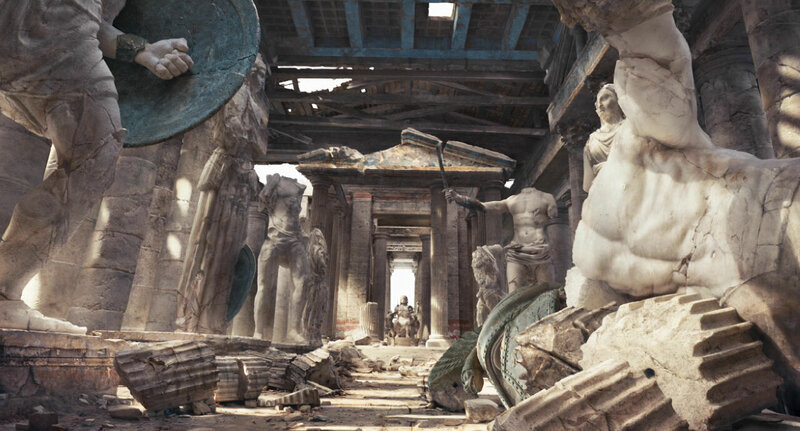 Mount of Idols Temple // The first version of the DMP before compositing.